This new and improved 2 step mug wrap is an inexpensive way to get started making sublimation mugs using your home oven or a conveyor mug oven. The 2nd step in the latch system allows for a tighter fit for smaller mugs. Therefore you only need one mug wrap size for mugs between 11 oz to 15 oz! Mug wraps allow you to make multiple mugs at one time without the cost of multiple mug heat presses. 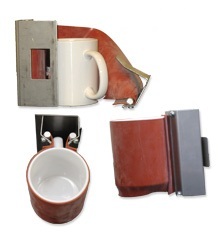 It should be noted that mug heat presses are a better solution for those who want a lower operating cost. Mug heat presses use less electric compared to heating up an entire oven if you are only producing a small quantity of mugs. Need to complete large mug orders on a regular basis? Mug wraps are ideal when used in the Hix conveyor mug oven and we have these too. Maximum efficiency = Maximum profits! Works on 11 oz - 15 oz mugs! The mug wrap is designed to fit 11 oz up to 15 oz mugs without making any adjustments. You will be able to image virtually top to bottom and handle to handle, with the use of only one wrap. While full top to bottom and handle to handle imaging is possible, it is not recommended until you have a firm understanding and experience with imaging mugs. As you become more experienced, there are tips and tricks that will make full wrap imaging more successful; while not foolproof, more consistent results can be achieved with proper preparation of the transfer. To achieve consistent results and reduce waste, keep your transfer width limited to 3/16" from the top rim and the bottom taper of the mug and if you stay at least a ¼" away from the handle you will see consistent quality results with very little waste. Also, quality mugs should be purchased. While a mug wrap helps to cover any imperfections in the mug itself, nothing can help a poorly coated mug. 1. TRIM TRANSFER: Before applying, trim the transfer so that there is no excess paper above or below the mug. Tip: trim the top of the transfer with a straight edge; this will assist you in lining the transfer up with the top of the mug to help eliminate crooked transfers. 2. APPLY TRANSFER: Secure the ends of your transfer to the mug using heat tape. TIP: Fold one end of the heat tape to make for quick, easy removal of transfer. 3. WRAP MUG: Lay mug wrap flat on the table, position mug in the center of wrap and bring ends of wrap together by pushing the male end of clasp through female closure until clasp locks in place. With the male end of the wrap in your right hand, hold the bottom end of the clasp with the thumb and forefinger of your right hand. Hold the top end of the female end of the wrap with the thumb and forefinger of your left hand. Insert the tab through the clasp and then holding both ends of the wrap between your thumb and forefinger, squeeze until clasp locks in place. TIP: Position any excess wrap towards the bottom of the mug. This will allow the mug to sit more securely in the oven. 4. PLACE IN OVEN: Make sure oven is set at 400° degrees Fahrenheit. Place your wrapped mugs in the oven top down, this will allow heat to be trapped inside of the mug, improving transfer quality. Space each mug at least 2 inches apart; 2" spacing allows for maximum airflow between mugs and more even heating of the entire mug. Cook mug for approximately 12 minutes. Some time adjustment may be needed depending on oven. 5. REMOVE AND COOL: NOTE: If you are not using a HIX Mug Oven with a Cooler then you will need to wear heat protective gloves to handle the finished wraps and mugs. Remove mug from oven with heat protective gloves. Lay mug on table holding the handle with one glove; with your protected thumb, simply pull up on tab until wrap releases. Pull the heat tape from the tabbed end and immediately remove transfer with one swift motion. Place mug in room temperature water to cool mug and stop sublimation process. CAUTION: Wrap will be hot. Use care when applying wrap to another mug. It is recommended to allow wrap to cool before using again. The following actions will increase the life of your wrap and help to prevent premature failure. Space your mugs at least 2" apart in oven, this will allow for more even heating and airflow between mugs. Also this will prevent mugs from banging together reducing the life of your wrap. Do not drop or bang mugs with wraps together. Handle with care, keep away from sharp objects and long fingernails. Small cuts can lead to tearing of the wrap. Only use on mugs that the wrap is rated for. Use of these wraps for anything else may give poor results or shorten the life of the wrap and could result in damage such as tearing. For unusually sized or shaped items please utilize a wrap custom made for your application. If the above procedures are followed and care is taken when handling these wraps, you should expect to get many cycles from your mug wrap.